Hydraulic steering trailers enable skilled HGV drivers to access sites which would be otherwise inaccessible. 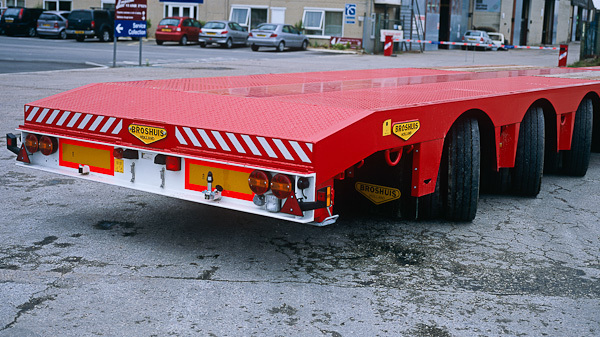 The longer the trailer, the more difficult it is to manoeuvre around corners, as the rear of the trailer tries to take the shortest route to the position of the front of the trailer. To overcome this problem, some trailers have steering back axles. So called ‘self-tracking’ axles enable an axle to freely rotate up to about 15 degrees from its natural position. Self tracking axles are designed to help with tyre wear and only marginally help with manoeuvrability. Generally only one axle on a trailer will be self tracking. Hydraulic steering trailers enable all axles to rotate upto around 45 degrees from their natural position. The degree of rotation is controlled by a wedge on the trailer’s king pin which communicates the degree of rotation of the tractor unit’s fifth wheel in relation to the main axis of the trailer. The axles of a hydraulic steered trailer will be mounted on turntables. Turntables capable of taking very heavy weight will be large and high, while turntables low enough to fit under a step frame or low loader trailer will not be capable of carrying so much weight.